In 2012 when Donegal were at their pomp they averaged a stat line of 34.4 attacking possessions with a shot Rate of 74% and a Success Rate of a truly remarkable 59%. Essentially they squeezed as much as possible out of average attacking possessions. They did much the same in this game – yes their Shot Rate of 67% was poor but a Success Rate of 55% is hugely impressive especially considering the fact that their big three did not fire (see below). On the flip side in 2012 Donegal allowed 35.3 attacking possessions with a Shot Rate of 72% and a meagre Success Rate of 45%. You had your chances against Donegal but for the most part they dictated, usually successfully, where those chances were allowed to be taken from. Derry too had their chances. Their deadball accuracy was excellent (6 from 6) but their shooting from play was not up to scratch. Donegal’s returns are a curate’s egg. Their big three up front (McBrearty, Murphy & McFadden) combined for a stat line of two scores from eight shots (25% Success Rate) with a combined weighting of -1.734. Of course the corollary of that is the rest of the team had an excellent shooting game with a combined stat line of seven from ten (70% Success Rate) with a combined weighting of +2.332. Going forward it is hard to believe that their full forward line will continue to perform so poorly – if the rest of the team can maintain anything like those Success Rates they are in business. 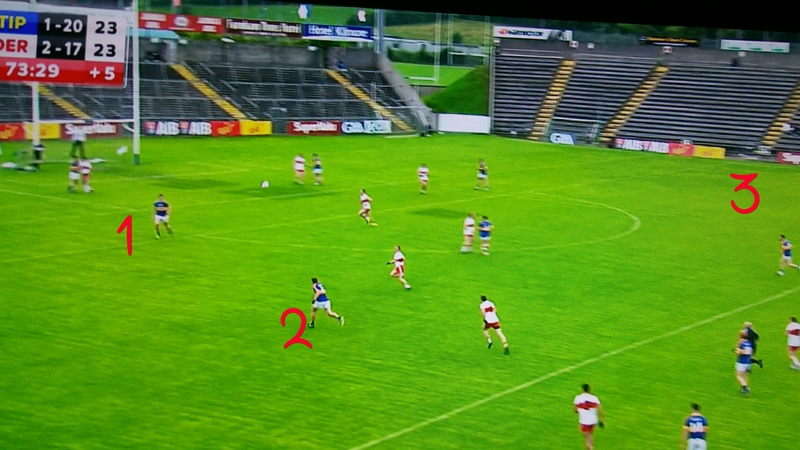 Derry’s shooting from play was very poor. 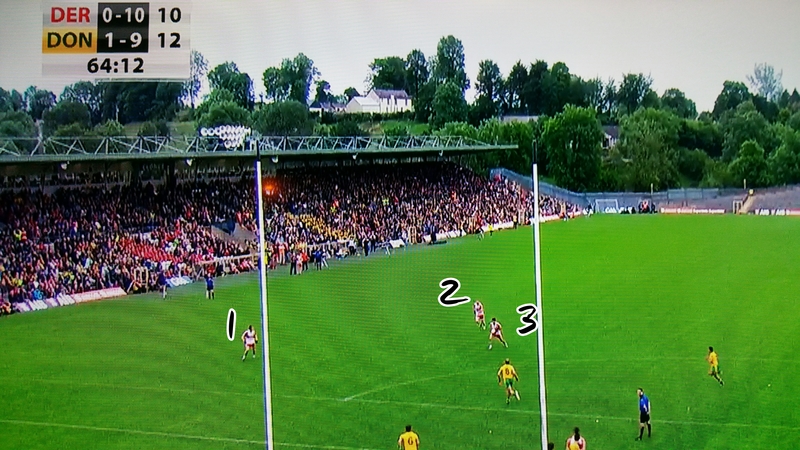 In 2012 Donegal “allowed” teams to have shots from outside the defensive shield on the outside of Sectors 4 & 6 and on the edge of the 45 in Sector 5. Derry could be said to have had seven attempts (see shot charts below) from these less pressurised zones converting three – McGoldrick, Holly & Heron. 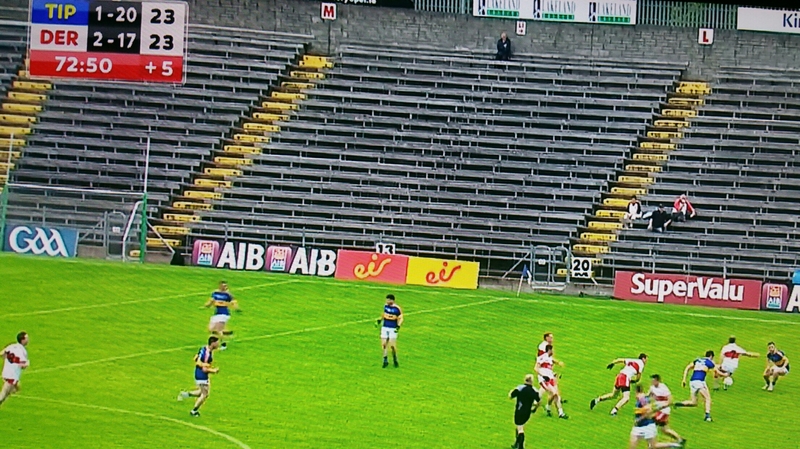 Normally this would be quite a good return however when this constitutes 44% of all your shots from play you need to be more accurate to (a) keep the scoreboard ticking over and (b) entice Donegal out. Again in the shooting charts below it is quite noticeable how clean the Donegal defenders kept the scoring zone – Johnson’s blocked goal attempt was the only shot from play that could be considered close to goal. Excellent deadball striking with nine from ten attempts converted including a ridiculously sublime sideline ball at the start of the second half in the middle of a 1-05 scoring block for Donegal. Unfortunately we do not have enough sidelines in the database to give an accurate weighting thus that point was treated as a “normal” free from Sector 4 – harsh on Murphy but just one of those quirks that appear with incomplete data. The overall volume of deadball attempts is low – 6.4 attempts per attacking possession versus an average of 4.9. This includes a sideline attempt from which a shot would not normally be taken. This low level can be attributed to excellent tackling but also a pre eminence on holding the ball across the 45 as both defensive shields were set. The most remarkable thing about the kickouts – apart from the symmetry of both teams winning 11 out of their own 18 kickouts – is the sheer volume that were converted into attacking possessions. 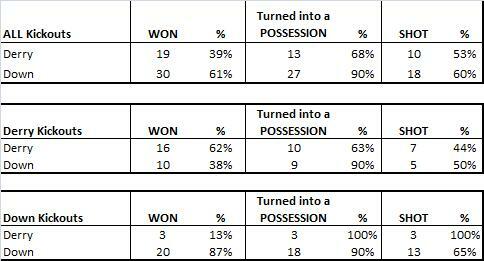 No matter who won the kickout 86% (31 out of 36) were converted into an attacking possession. It was not a case of kicking short and walking the ball up to the opposition’s defensive shield either; of the 34 where the cameras picked up where the ball landed only two were kicked short and one of those went directly out over the sideline! A case of competing for the kickout but if you lose it then retreat and only press the opposition when they meet your defensive line. One of the side effects of a slow, probing approach in trying to break down a defensive shield is the relative lack of turnovers. Possession is key – and king. In the two games where we have tracked turnovers the volume has been 58 (Dublin V Derry) and 56 (Tyrone V Down). In this game there was a total of 45 turnovers with 18% (8 total) coming from shots that did not go dead. So in a 70 minute game there was a non-shot turnover only every two minutes. Perhaps the most remarkable point on the turnovers is that not one of those turnovers happened inside the opposition’s 65m line and the receiving team got the ball inside their own 45 78% of the time(35 in total). No score was easily given away. That old chestnut – goals win games. The outputs are pretty evenly matched. There was only one possession in the difference with Derry being more efficient with their Shot Rate whilst Mayo were more accurate with their shots. Considering they were down to 14 men for the majority of the game that is an excellent effort from Derry to outperform Mayo. The main protagonist for Derry was Mark Lynch who hit an excellent 4 scores from 6 shots with a weighting of +1.495. Of course the corollary of this is that against 14 men Mayo will be disappointed to only produce an average number of shots from play. Doherty stepped up to the mark for them, taking 5 shots, but he only connected with 2 of them; no one was able to replicate Lynch’s performance for Mayo. Much of the post match discussion was around the volume and type of frees. Both teams had 9 shots at goal from deadballs; all Derry’s attempts were from frees whilst Mayo had seven frees and two 45s. Lynch had a wonderful game but his place kicking was below average. Now those returns might be on the harsh side as two of his misses were from outside the 45. The volume of frees from outside the 45 is low, so the averages from these sectors may be weaker than the other sectors but the evidence we have to date suggests that he should have done better (or not taken the shot on at all from that far out). A quick note for Lynn who won four of Derry’s shots from frees; it is a small statistic that will not show up anywhere but vitally important to any team. Mayo won 60% of all kickouts (29 versus 19) and managed 5 more shots from those wins (19 shots to Derry’s 14). As ever those bare numbers don’t tell the whole story. Mayo won a disproportionate 79% of their own kickouts (19 to Derry’s 5) however this is padded by the volume of short kickouts that Mayo employed. All bar one of those short kickouts occurred post the Fergal Doherty red card as Derry funneled back trying to set up with 14 men. 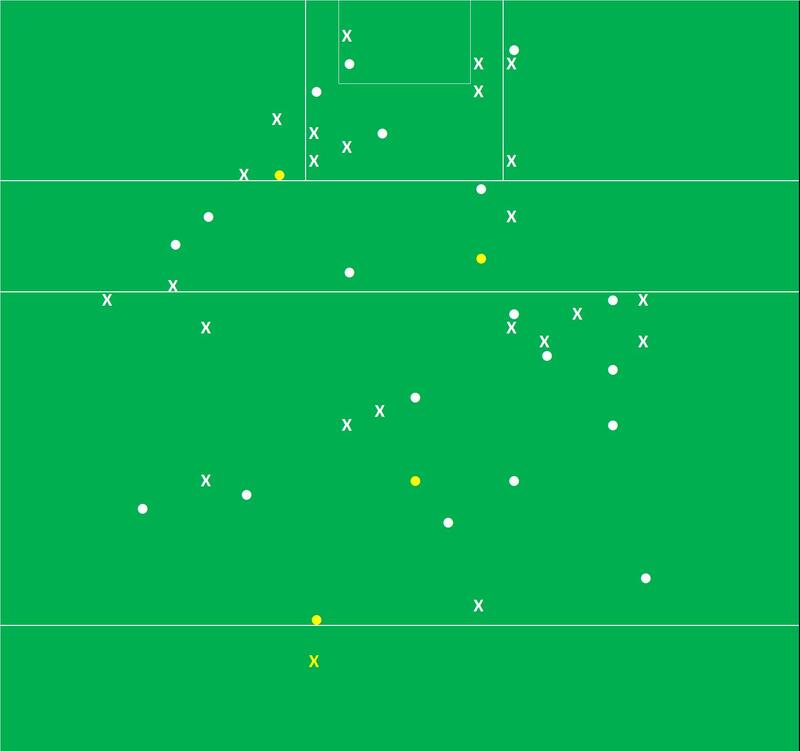 Rob Hennelly was too quick for TG4’s cameras on three occasions so of the 21 kickouts that we could fully chart 9 were taken short. Mayo won all 9 attempting 5 shots. Of the remaining 12 Mayo won 7 getting 5 shots whilst Derry won 5 getting 3 shots. So that is a shot differential of +7 for Mayo on their own kickouts. 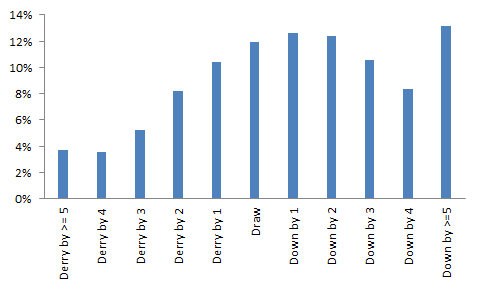 Derry won possession on 58% of their own kickouts (14 to Mayo’s 10). Unlike Mayo Derry only went short once. Of the remaining 23 kickouts Derry won 13 getting 10 shots whilst Mayo won 10 getting 8 shots. A shot differential of +2. A case of Mayo winning the kickout battle but Derry ultimately winning the war. A very open game with high volume returns for the main attacking metrics. Derry’s Shot & Success Rates were in line with the average; to return as high a weighting as they did shows that the shots they took were more difficult than would normally be expected. Down’s shooting overall was excellent with a high Success Rate and a high weighting. If they were going to be harsh in their analysis, after an excellent victory, then they may be concerned with their Shot Rate, especially with Donegal on the horizon. For all the possession they had they really should have managed to get another 2 or 3 shots off. Down will not have as much possession the next day and a similar low Shot Rate will inevitably feed into a low score. 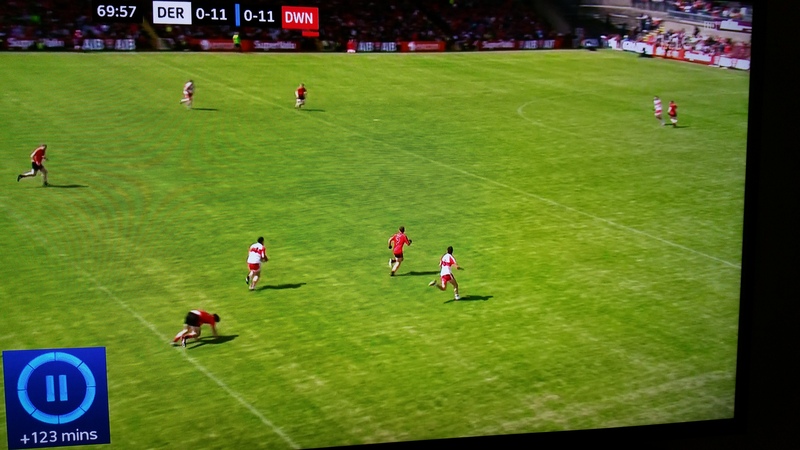 Derry’s shooting from play was scintillating. That performance is as good as we are likely to see in the Championship. Between them Eoin Bradley & James Kielt scored 0-08 from 11 shots (73% return with a combined weighting of +3.418) however Bradley’s hidden value was immense. He was involved in all 3 of Derry’s shots for goal; taking one and setting up the other two – including Lynch’s goal; he was fouled for two of the four frees Derry took a shot from and also “won” two of Derry’s three 45s. He was immense. The issue with Derry however was the Jeckyll & Hyde nature of their shooting strategy (see shot chart below). In the first half they took 14 shots from play with 9 (64%) coming from Sectors 5 & 8, the two most productive sectors. In the second half only one of their 10 shots from play came from these sectors. Their second half returns were still about above but they moved away (or were moved depending on your viewpoint) from what got them the lead at half time. Although overshadowed by Derry’s returns Down’s shooting was also very good. On top of being more consistent, with both halves being quite similar, they were also a lot more clinical. Down had 3 shots at goal and only the base of the post stopped them converting all 3. Both teams did very well to only concede five frees between them within scoreable range. Derry, and Bell in particular, are slightly hard done by here. Due to the fact that the volumes of shots from sidelines is so low we cannot give them an accurate weighting (yet!). As such they are considered free kicks – and Bell gets crucified for missing two free kicks in Sector 9 rather than one of them being a sideline. 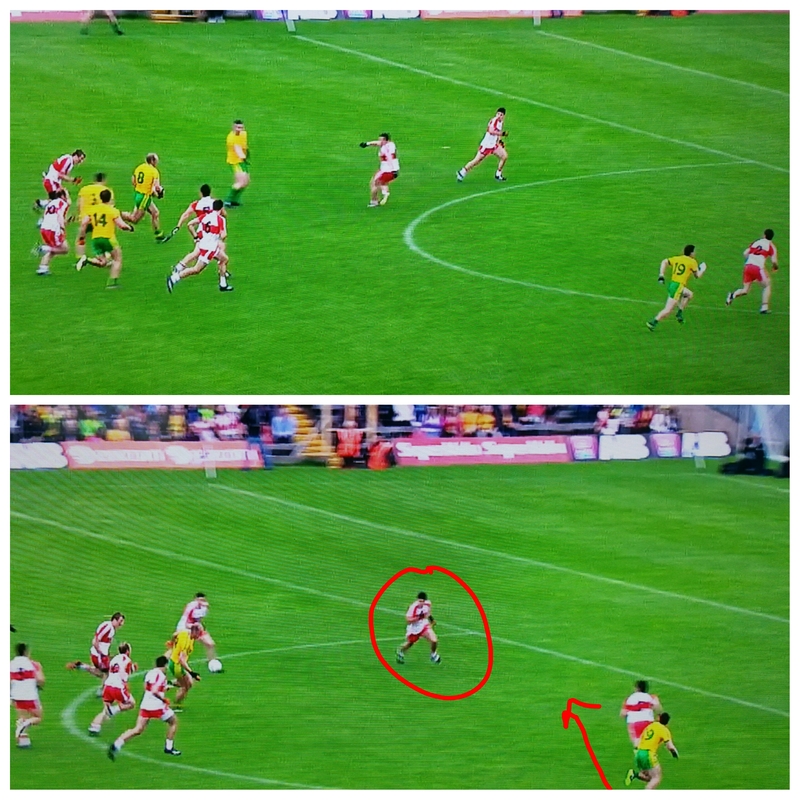 You can see how Derry’s shooting changed after half time. Their first half shots from play are in white whilst the second half are in black. They obviously have great strikers of the ball, as shown by their returns in this game, but too many times it was the wrong player (P Bradley, Quinn, O’kane) taking the shots from the wrong sections. The normal kickout data is included above but perhaps of more interest was what was happening on Down’s kickouts. 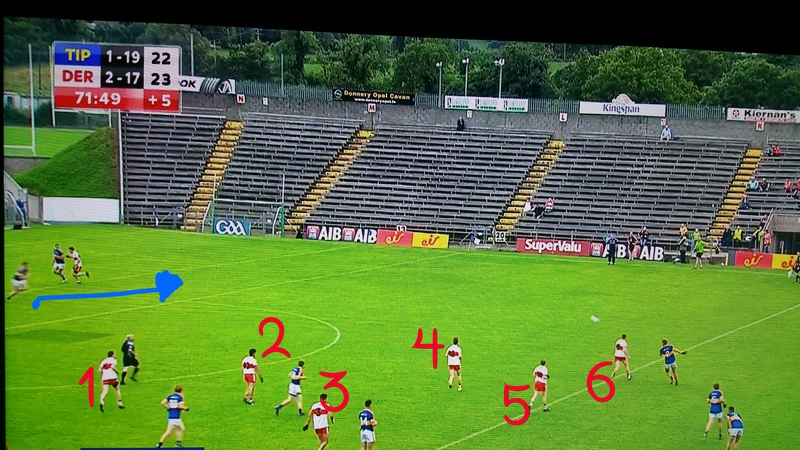 Derry ‘let’ Down have the short kickout which, as discussed in the Dublin-Westmeath game, is a strategy that has merit. However on the first 7 kickouts that Down took (all short) they managed to get a shot from each and bagged 0-04 points. The strategy itself is fine but what were Derry doing? If they were dropping back from Down’s kickouts where was the pressure when Down crossed the half way line. To implement this strategy is fine but you must follow up by blocking the route to shooting in your 45. 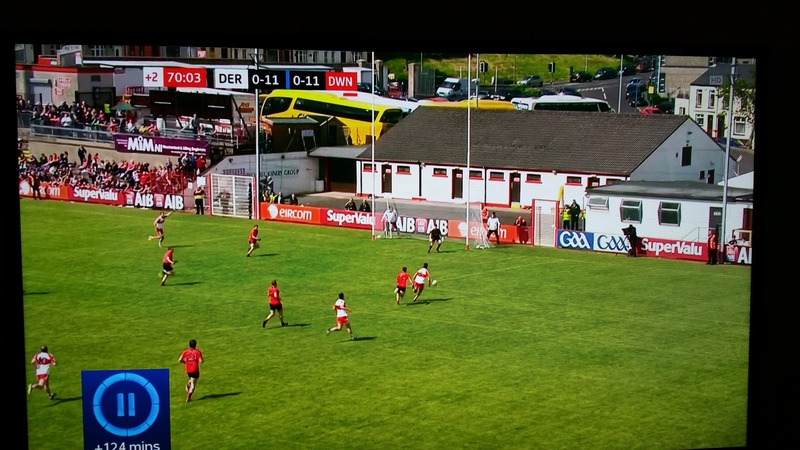 When Down did go long Derry were much more effective at stopping the shot coming. After witnessing the outcome of those first 7 short kickouts the Derry management really should have sold out and stopped anymore short kickouts. Going to be hard to find anything positive to say here. Donegal were very impressive in their dismantling of Cavan and visually they appeared equally as good against Derry. The numbers however would suggest that rather than Donegal being very good Sunday’s lopsided game was about how bad Derry were. Donegal’s returns were, more or less, in line with the average. Derry however were just not at the races. 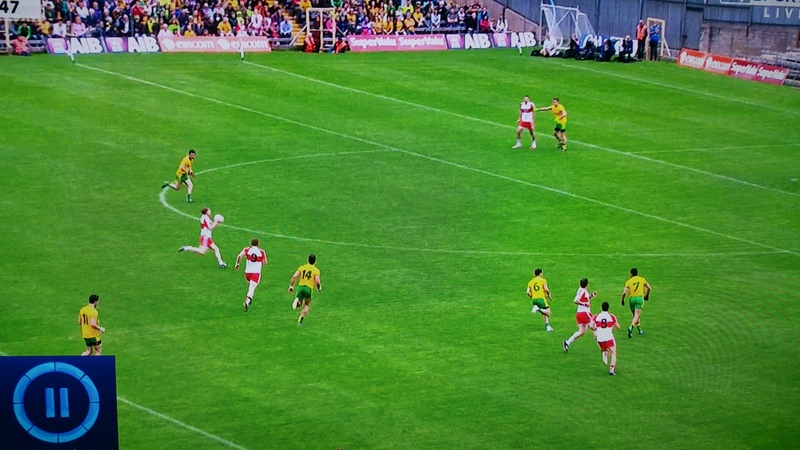 They had a poor, pondrous style of play that led to only 30 possessions within Donegal’s 45m line. Everyone knows what Donegal will do to you once you get close to goal so if you only have 30 possessions then you need to have some impressive Tyrone like Success Rate to win a game against them. Instead Derry turned in an uninspired, insipid performance up front. They had a Success Rate a notch below average but an Expected Return of -3.19 shows that they missed from some very scoreable positions. Murphy was obviously feeling his way back in – he didn’t have a shot from play. Some of the burden has been lifted from his & McFadden’s shoulders (in a scoring sense) with the play of the half forwards (David Walsh in this game, McHugh & McLoone against Cavan) and the emergence of Paddy McBrearty however they are still the main men. The commentators were (rightly) full of praise for McBrearty’s play however it must be noted that in two games he has a combined 2 scores from 7 shots with an Expected Return of -1.21. He is young and on a learning curve so can be excused but Donegal would do well not to place too great a burden on his shoulders just yet.